Day 1 - Marrakech - Zagora: Departure of Marrakech, by crossing the Col Tichka 2260m, visit of the Kasbah Ait Benhaddou, lunch at Ouarzazate. 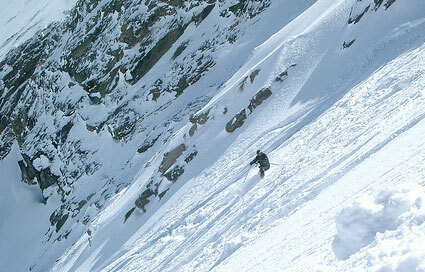 You will traverse the charming valley of Dráa to attain Zagora. 1hr30min of camel ride to reach the Camp and to admire the sun set. Over night in camp on half board. Day 2 - Zagora - Marrakech: Departure from Zagora to regain Marrakech via Agdz, Ouarzazate (the visit of the Kasbah of the city, and the studio of the cinema depends on time availability), lunch at Ouarzazate, crossing the Col Tichka headed for Marrakech. 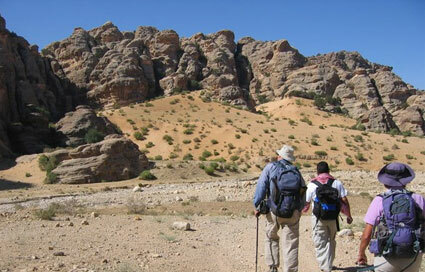 Day 1 - Marrakech - Valley of Dráa - Zagora: Departure of Marrakech to 07:00 of the morning. 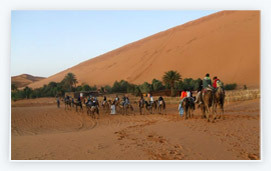 Visit Has Benhadou which one of most exotic and better is preserved kasbahs of the area of l' Atlas. It was the place of turning of more than 20 films, of which in particular " Laurence d' Arabie" and more recently " Gladiator". The village is currently under the protection of l' UNESCO. 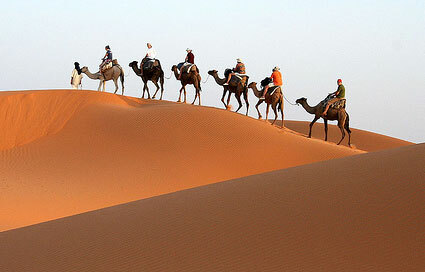 Continuation towards Ouarzazate, old garrison town, quiet city, starting point of the excursions towards the desert. The large kasbah of Taourirt and his artisan center are found there. Crossing of the valley of Draa long fertile ribbon of palm plantations, Berber kasbahs and villages, one of the longest rivers of Morocco. Arrived at Zagora, 1:30 with back of camel to laying down strolls sun, installation, dining and bivouac under tent in full desert. Day 2 - Zagora - Me Hamid - Chegaga: De Zagora, departure for Me Hamid. Stop with Tamgroute, visits Koranic library and factory of green potteries. The road narrows, the sandy landscapes are presented. After having crossed Tagounite and Ouled Driss, stop to lunch with Me Hamid surroundings 1:00, then continuation in 4x4 by the sandy track for the large dunes of Chigaga. Sunset, dinner and night with the feet of the large dune, under wandering tent. Day 3 - Chegaga - Ouarzazate - Marrakech: Departure for Marrakech by the track between the Erg of Chigaga and the desiccated bed of the drâa while passing by the lake Iriqui, then by Foum Zguid and continuation by the road via Taznakht, Ouarzazate and return to Marrakech. Day 1 - Marrakech - Gorges Dadés: Departure of Marrakech, by crossing the Col Tichka 2260m, visit of the Kasbah Ait Benhaddou, lunch at Ouarzazate. You will traverse Skoura oasis, Kalaat M'gouna, the valley of roses to reach the Dadés. Over night Dadés in hotel on half board. Day 2 - Gorges Dadés - Merzouga: Visite of Dadés gorges, destination Merzouga by visiting valley of the thousand Kasbahs, Tinghir visit of the local plameraie and kasbah, Todra Gorges Rissani, , Erfoud, and Tifilalte oasis, to attain the Camp Erg Chaabi in Merzouga. 1hr30min of camel ride to reach the camp and to admire the sun set. Day 1 - Marrakech - Ouarzazate: Departure from Marrakech towards Ouarzazate via col Tichka, visit of kasbah Ait Benhaddou, overnight at the hotel in Ouarzazate on half Board. Day 2 - Ouarzazate - Zagora: Ouarzazate - Zagora while passing by Agdaz, night in Camp on half Board under tents, 1h30 of camel's raid to reach the Camp and to admire the sun set. Over night in camp on half board. Day 3 - Zagora - Merzouga: Zagora - Merzouga while crossing Tazzarine, Rissani, night in Camp on half Board under tents, 1h30 of camel's raid to reach the Camp and to admire the sun set. Over night in camp on half board. Day 4 - Merzouga - Boulomane Dadés: Merzouga - boulmane Dadés, visit of Erfoud, Tenghir visit of the local palmeraie and Kasbah, Todra throats, Dadés throats; harms the hotel kasbah of the valley in half pension in Dadés. Day 5 - Boulomane Dadés - Marrakech: Boulomane Dades - Marrakech, while passing by Kalat Me gouna, Skoura, Ouarzazate, collar Tichka return the evening to Marrakech.